"Humans have always made noises, produced music and imitated their environment using their mouths. The twentieth century's sound landscape has been shaped by recordings and synthesis. 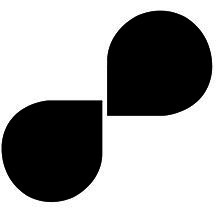 Humans have been naturally inspired by this when utilizing vocal organs in an unprecedented technical diversity. Since the late 1970s in New York, this art has been called "Human Beatbox". In the beginning was the breath... immersing us in the realm of non-verbal expression and in this passionate relationship between humans and machines. Trying to avoid anything that could alter this organic music, I kept transforming it while playing and creating. The performance of the Bionic Orchestra 2.0 tells their own story; the story of a passionate relationship between humans and machines. Ezra, through simple hand gestures, controls the enhancement of his voice, of sound and light travelling in space using an interactive glove which was designed and tailor-made by a team of researchers, developers, and designers in collaboration with the Organic Orchestra within the Atelier Arts-Sciences Grenoble. Through a "boosted" beatbox, as both an organic and technological performance, Ezra investigates the question of what we are in this technologically transformed environment. Alone on stage, but supported by several backstage technicians, he plays with this sound and light device over 360°. 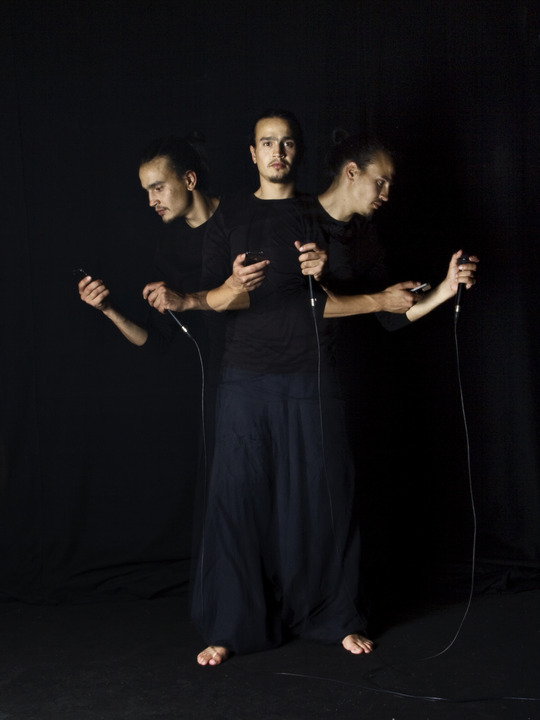 His non-verbal performance yields space to play on meanings, to new research on gesture control and motion sensitivity. Wishing to re-integrate traditional schemes of a music show, Bionic Orchestra 2.0 offers a unique relationship between artwork and the audience. Spectators, alongside the artist, are immersed in the sound and light-producing device made of 7.1 surround sound (sound spatialisation), traditional lighting and projected videos. Over the past four years, the Organic Orchestra has essentially focused on developing an immersive device controlled by newly developed control activators. The quality and value of immersion has generated a natural desire to appeal to and sharpen spectators' senses as a whole. Due to its impact on body and spirit, multiple-transmission, also covered by music therapy research over the years, has become a focal point in this process of prompting interactivity. It allows to materialize space without relying solely on vision, thereby yielding endless possibilities. Since 2012, the Organic Orchestra Co has been engaged in research on an object which allows to seamlessly control through natural gestures an entire sound and light system. An autonomous device, which is independent from its environment, allows to explore different ways of in-bodying a technology device, raising the question of the body as an instrument. First, they looked into the possibilities of wearing a jump suit (as a stage costume), then they opted for the idea of a glove involving all the functions of the control loop, spatialisation, as well as of sound and visual effects. 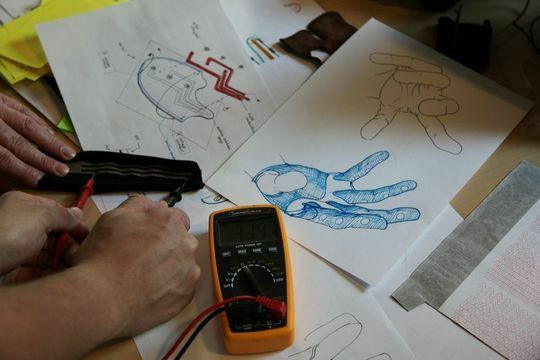 The following months will be dedicated to making the interactive glove and to the elaboration of body language, introducing new types of stage writing. We plan to integrate three projection platforms around the audience. The latter ones are inspired by the Voronoï diagram, a geometric algorithm occurring in many areas of nature (parched ground of the desert, tree leaves, forests seen from above...). 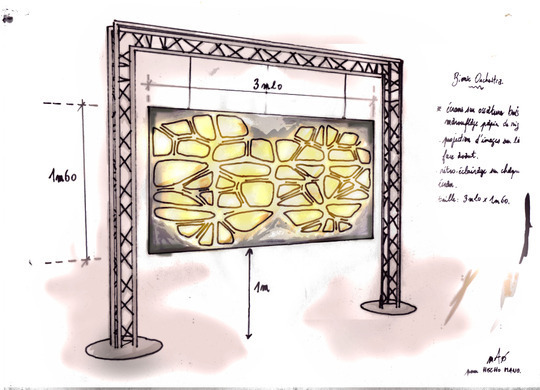 Made of wood and paper, they will be illuminated by video projectors, but also by traditional lights so as to enhance the paper's aesthetic value. EZRA (Vincent CHTAÏBI), artistic director, active and renowned member of international beatbox. He has performed on stage throughout the world; playing solo at some of the most mythical venues in France, such as the Olympia, Cigale, Transmusicales… His natural ability to adapt and his ease on stage, have brought Ezra together with world-class artists (Kid Koala, Bauchklang, Wax Tailor, One self, Socalled…) and allowed him to go on a world-wide tour with the singer Camille. He has been involved in numerous productions blending music, video, dance and scenography, such as the Bionic Orchestra projects, Five Fingers or the Fabrique Immatérielle and the Hey Company! Besides the stage, he is also devoted to developing his discipline through workshops at schools, prisons, hospitals, music conservatories as well as through participation in university research and developing a beatboxer network in France since 2005. 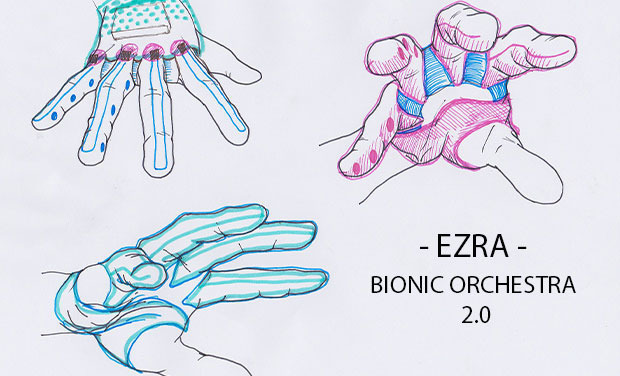 For over four years now, Ezra has been working with Bionic Orchestra engineers on an enhanced beatboxer principle through the design of devices which can transcend voice and allow to control sound, light and video, from the stage. With kind support from DRAC - Pays de la Loire, DICRÉAM, General Council in Sarthe, Fonds SCAN, City of Le Mans, and the CNV. The experience is unique and the adventure promises to be overwhelming; The Organic Orchestra Co needs you to finalise their project. 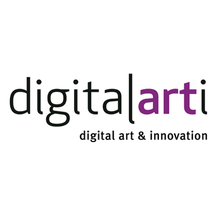 N.B: The 15,000 Euro contribution will cover the costs for the above mentioned items, but does not include artists' fees and the costs of past arts-sciences residencies and research. We have reserved a surprise for you in case of a 120% contribution. Receive the program of l'Asso program and a thank you on our website. PREVIOUS REWARDS + Sketch in PDF signed by the designer and the artist. PREVIOUS REWARDS + 1 invitation to the show preview at R-i, Biennale Arts-Sciences, à Meylan (France). PREVIOUS REWARDS + meeting with the team and backstage demo after the show preview.